This class is held in the Holy Innocents Church in Fallowfield every Monday. 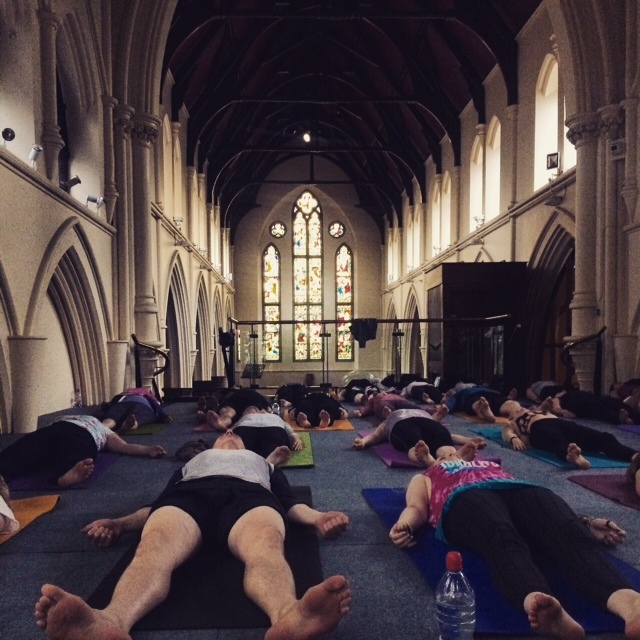 Usually when a class is advertised as ‘in a church’ it’s located within a back room or side building. This class however is actually held within the church, pews moved aside, smack bang in front of the alter. As you can probably imagine it’s a huge space; with high ceilings and ornate stained glass windows. It’s grand, calming and visually stunning. We began the Vinyasa class in relaxation; lying back on our mats, opening our hips and connecting with the breath. As ‘Vinyasa’ translates to ‘connection’ this relaxation period helps us all connect with our bodies, breath and mind, setting us up for what will be a very fluid class. Music plays throughout the class to ensure we remain in sync with one another and, more importantly, ourselves. Lianne sits at the front of the class as her students enter. She’s surrounded by candles and wears an inviting smile. She’s softly spoken and has a calming influence over the room. She’s already arranged people’s mats in a semi-circle around the stage to ensure all her students can see her. She stands on the small stage and draws everyone’s attention towards her as the class begins. She takes us through the warm up sequence, all the while making sure we remain connected to our breath. She wanders round the large room to ensure we are all in our most beneficial postures -yes, what’s right for me probably won’t be right for you! The class isn’t too fast-paced but as it’s all about the fluidity of your movements it’s worthwhile intently listening to Lianne’s instructions. She announces each movement in descriptive detail so you don’t have to come out of postures to find out what the heck’s going on. As this class is held in Fallowfield my first thought was it would be filled to the brim with uni students (it is Manchester’s student centre after all). However the array of attendees varied; there were advanced yogis rolling out mats next to complete beginners, students next to pensioners and men next to women. As everyman and his dog are in some mad rush to get nowhere faster nowadays it’s not unusual to see people from all walks of life turning to the yoga mat to find a 60 minute air pocket of stress free bliss, and this class is no different. Everyone wants to learn how to reconnect with themselves again, to learn how to take those deep breaths into the boardroom and learn how to not lose your mind during exam season or when the kids are on an e-number induced rampage. That’s what the feel of this yoga room was – a mixed group of people learning how to be the best possible version of themselves off the mat. This is the first Vinyasa flow class I’ve done in about 8 years so I’m not preaching from a place of yogic superiority when talking about this class. I’ll happily own up to having no knowledge of this sequence, I’m basically a beginner! However, I can happily say this sequence is easy to follow. If you’re new to yoga this is the ideal introduction to an ancient tradition. You’ll learn some challenging postures partnered perfectly with relaxing pauses and calming sounds. If, like me, you’re coming to Vinyasa flow from a particular style of yoga (Ashtanga, Iyengar, Yin etc.) then you’ll find yourself at home on the mat whilst still experiencing new and challenging asanas. Ashtangis’ especially will be familiar with these postures but the sequence will not be what you’re used to. It’s useful to remember that if you want to explore different aspects of your mind then you need to challenge your body to do something different. This class is the perfect place to start.